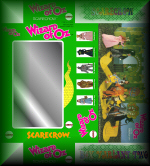 Mego Scarecrow (Item No. 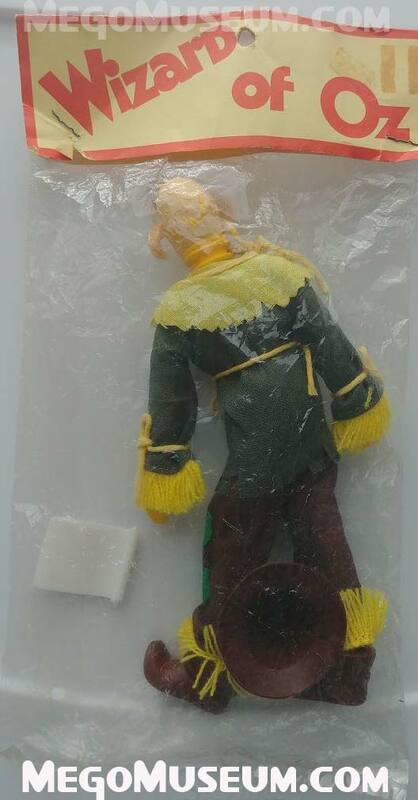 51500/4): The fourth in the line of Wizard of Oz figures, this item recreates the character of the Scarecrow (Ray Bolger) from the film. The Scarecrow comes on a standard male Mego body with yellow hands. 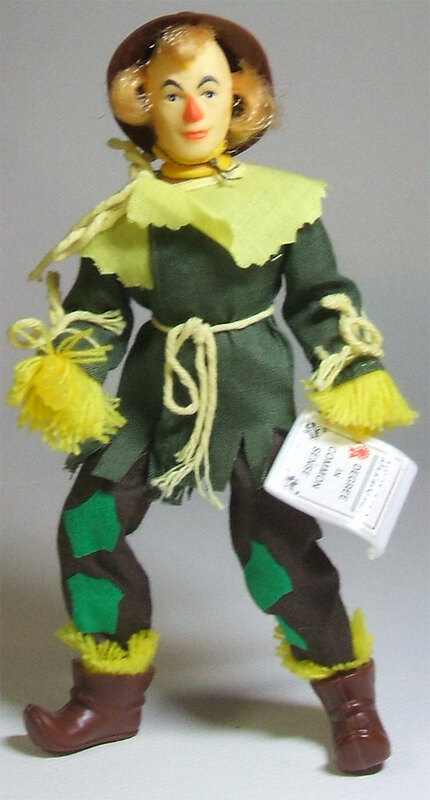 His outfit is comprised of an olive green open-front tunic with a jagged yellow collar (meant to represent the lower part of the Scarecrow’s burlap-sack head, no doubt) attached at the neck. The tunic has pale yellow lengths of “rope” attached at the sleeve cuffs, waist, and neck that are tied into bows. The hem of the tunic is jaggedly cut (like the Hulk’s pants). The pants are brown with a green, squarish patch over each knee and shin. Tufts of yellow yarn (meant to resemble straw) are sewn inside the cuffs of both the tunic and the pants. A brown, hard-plastic hat (with a thin elastic band which goes under the chin) and a pair of brown, hard-plastic shoes complete the ensemble. 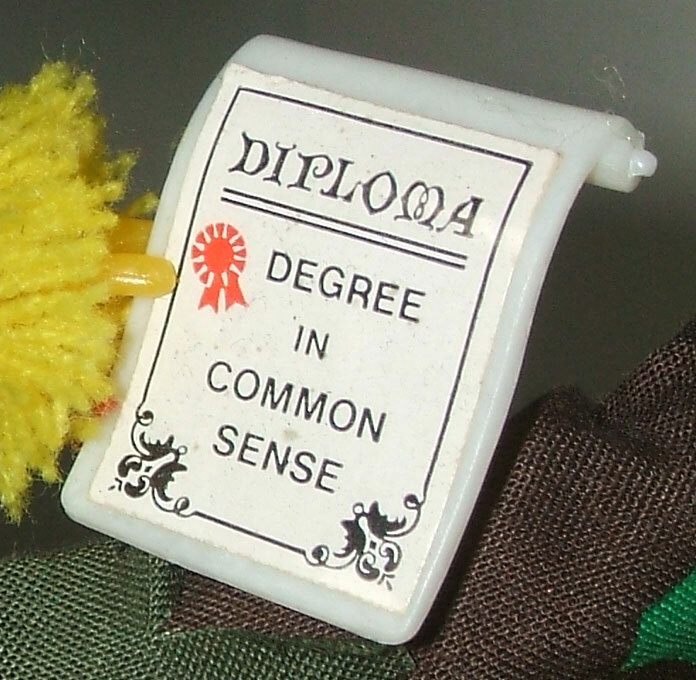 His only accessory is his trademark Diploma, cast in white plastic with a square sticker depicting the text of the document. Emerald City Gift Set (along with the other six figures from series one). 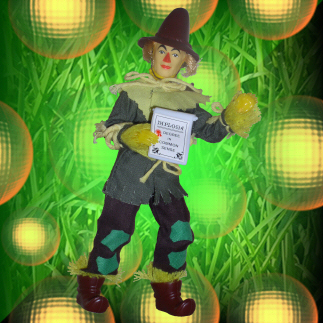 Figure Variants: The Scarecrow comes on a Type 1 or Type 2 body. 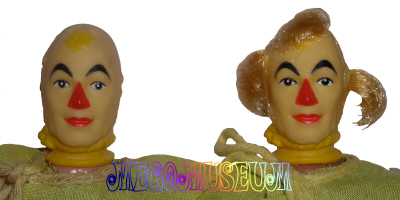 Also, the head was made in “hairless” and “hair” versions (discussed below). Caution Collectors: The elastic band on the Scarecrow’s hat can become easily stretched out, so be careful not to strain it unduly. Also, take care not to lose the Scarecrow’s shoes when handling a loose specimen; the hard-plastic footwear fits very loosely, and falls off the feet at the slightest pull of gravity. Did You Know? : The “hairless” head Scarecrow is probably the best-known of the Wizard of Oz variants, due to its distinctive and obvious nature, and has been widely-documented for years. 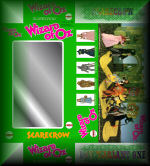 The Scarecrow’s head came in two styles, as can be seen in the image above. The first style, known as the “hairless” head, had no rooted hair in it, using only molded-in detailing on the top and sides to give the impression of tufts of errant straw (left). The second style added small patches of rooted blonde hair into the existing molded-in detailing to more convincingly represent escaping cranial straw (right). The “hairless” head is far rarer than the second “hair”-style head, and is typically only found on Type 1 bodies. 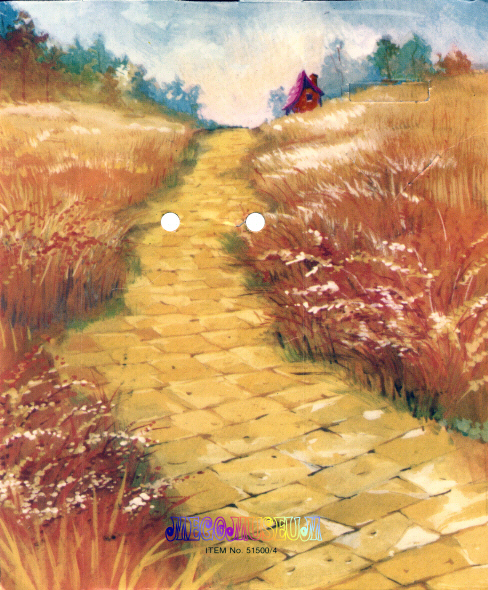 Above is an example of a mint-in-box Type 1 Scarecrow with “hairless” head in a “plain green” box (left), and a mint-in-box Type 2 Scarecrow with “hair” head in a “yellow brick road” box (right). 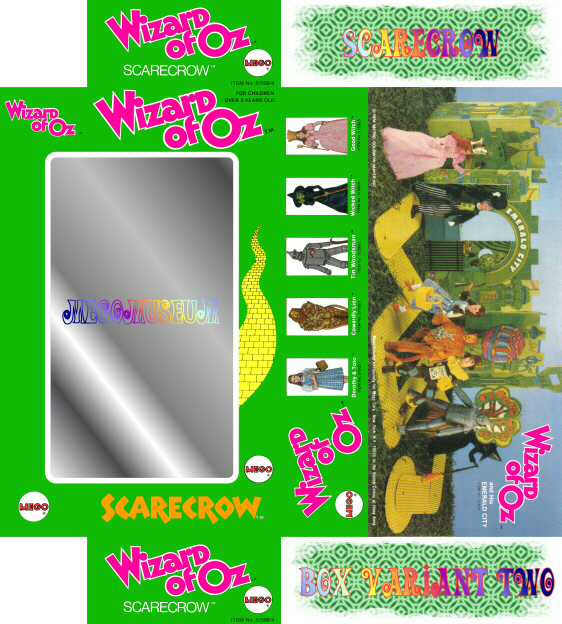 Above is an example of a catalog mailer box for the Scarecrow figure. 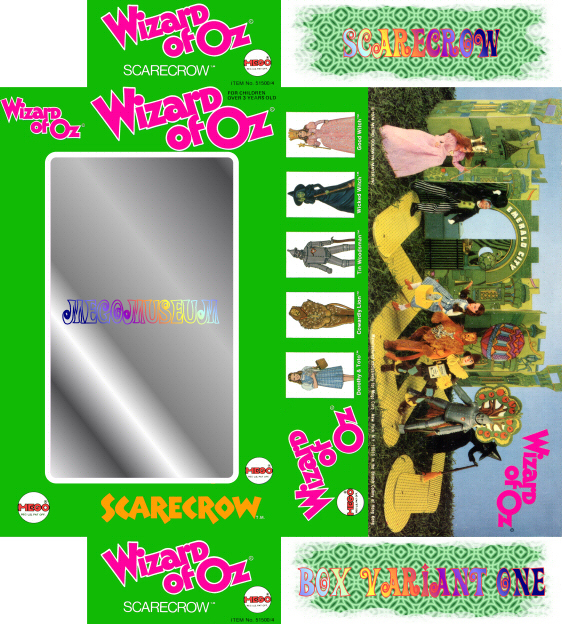 Above is another example of a catalog mailer box for the Scarecrow figure (perhaps the “C” denotes a Catalog release?). 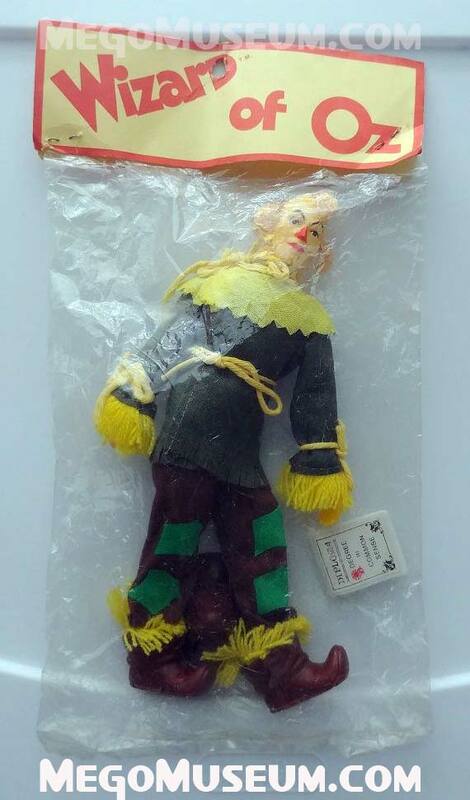 A new addition to the MegoMuseum is this wonderful Scarecrow in a baggy with a header card. It’s largely believed these figures were “end run” pieces sold quickly to stores as closeout merchandise. Thanks to Scott Arendsen for sharing this goody. So having a diploma means you have brains. Hmm… Not convinced of that myself, but the Scarecrow buys into it. Probably because of his mental condition to begin with. Mego’s Scarecrow comes with a diploma that has not been factory reproduced. Scarecrow wears a pair of brown boots that are unique to the character and have not been factory reproduced. 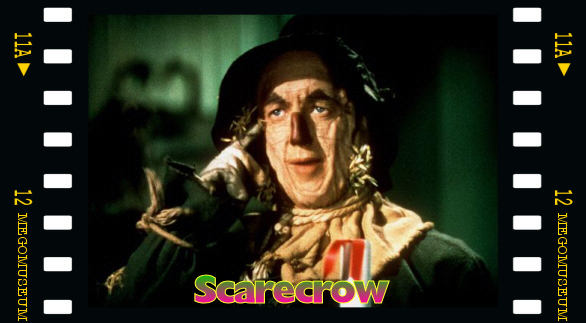 It’s important to keep your brainless head warm, so with that in mind the Scarecrow wears a hat. 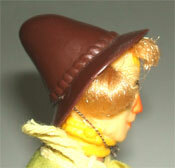 This hat is unique to the character and has not been factory reproduced. The hat should have a string attached to help hold the hat on the head.